Here’s Wiley in the parade, waving with both arms! Bribery is not, I admit, the best way to motivate a child. But sometimes, a nana’s gotta do what a nana’s gotta do. 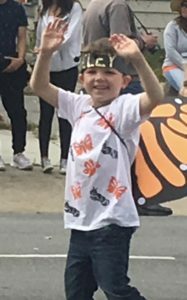 Every year since 1939, the children of Pacific Grove, Calif., have donned paper wings and paraded in the streets to celebrate the arrival of thousands of Monarch butterflies that flutter in each fall to spend the winter. The city is called “Butterfly Town USA” and “America’s Last Hometown.” I just call it home, the place I raised my children, buried my first husband and spent most of my adult life. Twelve years ago, after I remarried, my new husband changed jobs and we moved to Las Vegas of All Places (as my mother would say.) Then came grandchildren. Six babies in seven years. With every visit, it grew harder to say goodbye. Finally, my husband retired, and we recently moved back to the house where my kids grew up, a few blocks from where my youngest and his wife live with their three little ones, and a short walk to where the Butterfly Parade takes wing. The parade is a tradition for the town and for me. My three kids marched in it every year from kindergarten to middle school. And even after they grew up, I seldom missed it. Last year I drove from Vegas to Pacific Grove, to watch my first grandchild, Randy, march with his classmates. It was six days after a gunman had opened fire on the Las Vegas Strip, killing 58 people and injuring hundreds of others. Sometimes, when the news is even uglier than usual — as it was then and has been lately — it helps to watch children and try to remember that the world is a mostly good place with far more good people than bad. It was a gift last year, a healing balm, to see children waving and families beaming and police cars sporting butterfly wings. I could hardly wait for this year’s parade to cheer both for Randy, who’s in second grade, and his brother, Wiley, in kindergarten. The day before the parade, Wiley came to visit. We were finishing lunch with a scoop of ice cream when he said he didn’t want to march in the parade. I quickly listed reasons why he should, such as the fact that his dad did it when he was Wiley’s age, in the same kind of wings, and besides, it’s a tradition. He stared at his empty bowl as if trying to picture his daddy wearing butterfly wings. Then he looked back at me. His parents would not want him to have more ice cream. But they would definitely want him to march in that parade. So we did. And the next day, my husband and I stood on the curb cheering with my son and his wife and her parents and her sister and 3-year-old Eleanor, who’s not old enough to march in the parade, but will be soon and won’t need to be bribed. When Wiley marched by in his wings, with the headband for his antennae slipping down over his eyes, he yelled “Nana!” and waved with both arms. I laughed so hard I fell off the curb. Then Randy came by in an otter suit waving with both paws and I fell off the curb again. And there, for a while, in a happy sea of smiling children and laughing adults and paper wings, all was right with my world. I wish you could’ve seen it. Ice cream and a pinkie promise might not solve every problem. But sometimes it’s a pretty good place to start. “I wish you could have seen it.” Well, we did. We saw it perfectly with the picture you painted with your words! Such a blessing that you are back home – in NV there were short “memorials” to that awful night last October – cannot believe it’s been a year already. And yes, there is much more good in the world than evil… just have to let the scales fall from our eyes so we can see it. Thank you for reminding us there are still good old fashioned things going on in the world. I saw a monarch yesterday ( which is unusual in SC but was a part of my childhood growing up in Wisconsin ). It has been two years this past week since a school shooting tragically affected our community and one of my grandchildren. That single butterfly must have been a sign of renewal for us. I love your stories that always resonate with me. Thank you! Thank you dear Goddess. You always make me smile. I have no grandchildren but I live through yours. ? I love this! Thanks for sharing these tender moments. I remember the monarchs from late 1970s when we were at Fort Ord. Such a beautiful place to miss! Glad you can share with all your grandkids Sharon.